This article contains spoilers for the movies Pitch Black and Serenity. Whaddaya mean you haven't seen them? Go, now! Watch them! They're brilliant! See you back here when you're done. Roleplaying games are great. For many, many years, I've loved taking part in all kinds of RPGs. From Dungeons and Dragons to Call of Cthulhu, Superworld to Traveller 2300AD, The Morrow Project to Maelstrom, I've played all kinds of games. Over the years, I gravitated most towards Runequest and Call of Cthulhu, from Chaosium, but dabbled with just about every genre and every type of game system along the way. These days, I don't get the chance to play in groups as much because of location - but it strikes me as I write short stories (and work on those novel things too) that there are certain lessons that can be drawn from RPGs that can help writers. 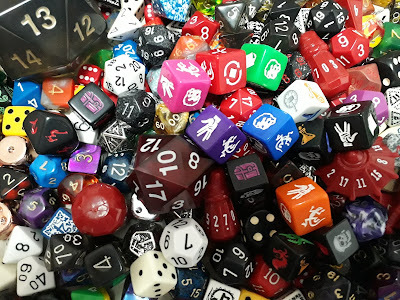 So... here's five tips, particularly for genre writing but with perhaps some lessons for all, gleaned from the world of tabletops, dice rolling and the extraordinary, silly accents perpetrated around the dinner table. There's nothing more infuriating when playing a roleplaying game than having a gamesmaster busily parading their wonderful plot around while the players having either nothing to do or making little or no impression on the story being told. I remember one fabulously dull Vampire session where the players frankly didn't need to be there as the GM's non-player characters busily went about resolving the plotline all by themselves. So here's the thing - in a gaming session, it should be about the players. These are the heroes. It should be their decisions that save the day - or lead to disaster. The same happens with books. If the central character(s) are superfluous to the storyline, then there's something wrong. What the central character wants, desires, fights for, all those things should be central to the plot. If they're just a passenger to the plot, then... the RPG version of this particular book would be pretty boring to the players. Give the heroes of your book centre stage, and let them shine in the story. 2 - Wait, who's going to be the cleric? When you start up with a new group in a roleplaying game, an experienced group will often try to make sure there is a balance within the party. So you'll see in a D&D game a combination of a fighter or two, a wizard, a cleric, a thief - that kind of thing. Obviously, in a game environment, this stops the party from getting stumped by the first hurdle they encounter that lies outside their skill set - be it a locked door or a need to detect magic. So how does this translate to writing? Well, it's often good to avoid duplication of roles. You see this quite often in movies. Let's take two movies as examples - Pitch Black, the first movie to introduce the Diesel-powered character of Riddick, and the Firefly continuation Serenity. Both movies feature characters who duplicate the skillsets of others - namely, the pilot. Now, when you see two pilots in a movie or TV show, you can pretty much start counting down on the life expectancy of one of them, and so it proves in those movies, with both Fry and Wash coming to sticky ends. Still too soon for Wash, I know. When you have characters that have the same skills as others in the story, it creates redundancy, and you want your stars to stand out, to not just be an interchangeable piece. Why should we care about Hero A when Hero B can do the job just as well? So in creating the cast for your story, consider the different strengths that each character can bring to the tale - they may not be as clear-cut differences as the character classes in many RPGs, but consider what makes them unique, and what that brings to the story. Often, as the GM for many a game, I've sat down and planned out all kinds of aspects of the world in which the characters are operating. And you know what? There's many a time that hardly any of those aspects have been explored as the game session has gone on. What has often happened, though, is that a throwaway moment in the game session stands out, and I jot a little note down about it to return to later, and it grows to become a substantial part of the ongoing campaign. As an example, in one Runequest campaign, a random scroll with the history of one of the deities of the setting caught the interest of one of the characters. I jotted some details down about it and, later, introduced a plot point around that which ultimately led to members of the party helping to re-establish a temple to that deity, and reintroducing his worship to the game world. The players were focused on that element of worldbuilding because it grew from their actions. The same can happen as you write. Whether you're a plotter or a pantser when it comes to writing, there can often be a moment as you write that stands out and maybe hints at something more. Maybe it's a passing reference to a place, or a person, or something else, but just jot it down as an aside as you go, and consider if it's something to work back into the story later. If it seems as if it's naturally grown from the flow of the story, that's better than some of the infodumping of world history that feels forced into many a tale. 4 - A room full of orcs? Again? One thing that you never want to do with your gaming group is bore them - and presenting them with the same kind of challenges over and over is a surefire way to do that. So, when devising the stronghold that your players are going to storm, you mix it up a bit. You have different types of opponents for them to face, you have traps to overcome, you put a bit of strategy into how the party might triumph without having the same fight repeatedly. There's the odd random encounter in there, and, most of all, there's a cool villain that marks the overall triumph. You don't finish the last room in the scenario with a fight with a couple of kobolds - you finish it with a dragon, or a skeleton lord, a lich, something scary and impressive and that the players haven't faced in the rest of the scenario. Similarly, with writing, you don't want your hero to have the same hurdles time and again, whether it's fighting one-on-one with a series of identikit thugs, or repeating the same cycle of encounters through the book. Soon enough, a reader will stop caring about the hurdles if they're always the same and just leaf past them until the story resumes. Or, worse, stop reading the book completely. Familiarity really does breed contempt, so keep it fresh, and always have your heroes on their toes. The splendid Mr Bester, from Babylon 5, a villain who grew more effective with time. 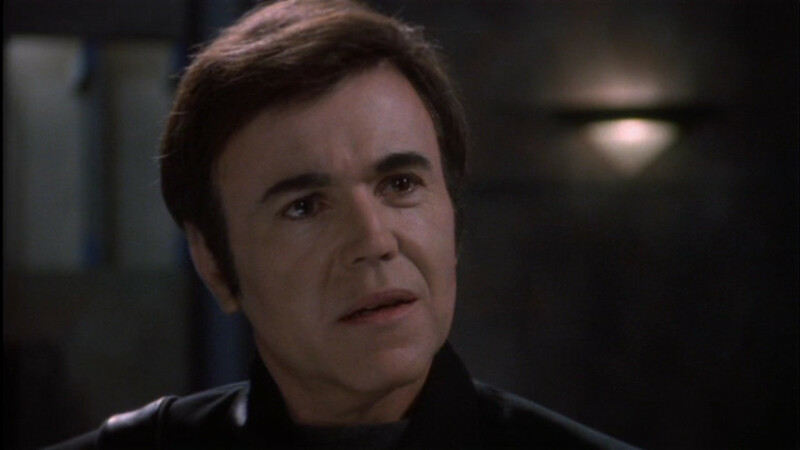 As played by the incomparable Walter Koenig. There are a few characters over my roleplaying career that my players came to openly hate - and it was always the villains that they just couldn't get their hands on right away. When the ultimate villain keeps one step ahead of the players, it makes them really, really want to deal with him/her when they get the chance. The same can be true in writing. It doesn't have to be as contrived as the villain escaping at the last minute as much as clues being discovered along the way that identify who the big bad is, but tantalisingly the heroes still having to track him down, uncover his plan, and deal with him in the end. This can be particularly effective in a series, of course, where you have more time to draw out the threat. One of my favourite examples in TV of this is from Babylon 5, with Mr Bester, the psi cop, who goes from irritant to menace to one of the most downright hated characters in the show - all while having his own reasons for doing what he did. I won't spoil, in case you haven't seen, but if you haven't, you really should. In short, if you've got a great villain, don't be in a rush to let the heroes defeat them. Let the characters build how they feel about the villain, let their anger be felt by the reader, and the reader will be drawn along for the ride. 6 - Wait, I said five tips... that must mean it's time for your suggestions. So there we are, five ideas from the world of roleplaying games that might help when it comes to your writing. But what are your experiences? What have you carried over from RPGs into your writing? I'd love to know, which means... the comments section below is all yours. Looking forward to hearing from you! One I would suggest is that 'the heroes can die'. In RPGs all the characters can be killed off, no-one is invulnerable. It should be the same in novels. George R.R. Martin has done this well with A Song of Fire & Ice, so you have no assumptions about who will make it to the end.